In the Mid-2000's, then North Dakota State University coach Tim Miles (current Colorado St. coach) recruited a class that included Ben Woodside (who would go on to become the school's all-time leading scorer and score 60 points in a game during his collegiate career), Mike Nelson, Lucas Moorman, and Brett Winkleman. All 4 players redshirted their freshman year, meaning they would be eligible to make the NCAA Tournament their freshman year (NDSU was transitioning from D2 to D1). All the hopes of the program rested on that class, and they delivered with a NCAA Tourney berth their senior year, the first year they were eligible. Though the circumstances aren't exactly the same, North Dakota's class of 2014 (they were freshman last year - 2 of them redshirts) feels similar in that everyone in counting on this class of five to be the one that leads them to an NCAA Tournament when they are eligible, starting next season in the Big Sky. This excitement only increased when they finished strong last season, surging to win the Great West Tournament before bowing out to Air Force in the CBI. Of the 10 youngest teams in America last year, UND was one of two (along with Memphis) to have a winning record. All of which begs the question - who are these guys and are they really that good? The best of the bunch (after one season of work) is Troy Huff, who at 6'4'' is the most athletic member of the team, and probably the best player in the fledgling Great West Conference. He led the team in scoring at 13.1 PPG, but he came on especially strong at the end of the year, scoring in double figures in the last 14 games of the season (including 20 against Air Force). In his second career game he scored 21 points against Wisconsin, so clearly he has the talent to contribute and be the star for UND. He is a solid rebounder (which is nice for a team without a lot of size) as he snagged 13.2% of defensive rebounds and 7.5% of offensive rebounds. He needs to improve his shot selection a bit and his FT shooting (your star guard has to shoot more than 62% from the line), but he has the talent to be one of the best players in the Big Sky when he joins the conference. Jamal Webb played the most minutes on the team, and it is right to be excited about his potential as a 6'1'' PG. He shot a respectable 48% from 2PT and a solid 40% from beyond the arc, giving him a solid EFG%. He also had an excellent 29.7 Assist rate, one of the 100 best in the country (and would have been top 5 in the Big Sky). Also, for his size he was an excellent rebounder - pulling down 5.4 RPG including 16.6 DR%. He combined all of this with the best steal rate on the team, giving him a poor man's Jason Kidd-like line: 9.3 PPG / 5.4 RPG / 4.0 APG / 1.6 SPG. That is making a lot of things happen as a freshman. However, there are two things he will need to improve to take the next step. First is FT shooting... like Troy Huff, he was mediocre there, shooting 44/80 from the line (55%). He needs to get to the line more and needs to shoot a better percentage, and he could become a dangerous scorer at around 12-15 PPG. He also needs to cut down on his turnovers, where he had a 30.0 TORate, worst on the team. He coughed it up 3.4 times per game, which is tough to handle for a team when that is your primary ballhandler. He needs to work on that. Aaron Anderson is the smallest member of the class at 5'9'', but he does a lot of things very well. He was great at getting to the free throw line, as he drew 5.8 fouls ever 40 minutes, giving him 145 attempts for the year, most on the team (impressive given his smaller usage rate compared to other guys). And unlike Huff and Webb, he was diligent on those attempts, making 80% of them. He is also a solid passer and defender for his size. Like everyone else, there are some areas to work on. He turns it over more than he gets assists, which is always a problem for a PG (only one person on the team posted a better assist rate than TO rate, and we will get to him in a second). Also, Anderson needs to improve shot selection, or shot efficiency. He shot an ugly 36.8% from inside the arc last year (compared to 35% from beyond the arc)... A lot of that was offset by the fact that he is such a good FT shooter and so adept at getting to the line, but if he had shot 45% he is that much better and really would become an extremely dangerous offensive weapon as the 6th man. Josh Schuler was a little under the radar when compared to guys like Huff and Webb, but he is a huge part of the future for UND. At 6'2'' he was the team's 4th leading scorer, but one of the team's most efficient players. He shot just 43% inside the arc, but 35& outside of it, as well 78% free throws. He also took care of the ball, as he was the only member of the team to post a higher assist rate (15.4%) than TO rate (13.2%), which is huge to maximize scoring opportunities. As always, his game is not perfect. On a team that lacks ideal size, everyone needs to chip in and rebound, and Schuler was the worst rebounder on the team. He needs to get in there and get better (and granted, he is the third smallest guy on the team). He also could definitely become a more efficient scorer, as 43% shooting on 2s is not a very good mark still, would like to see that closer to 50%. Last is Brandon Brekke, who is the closest thing to a post presence the Sioux have in this class, though he is just 6'6''. 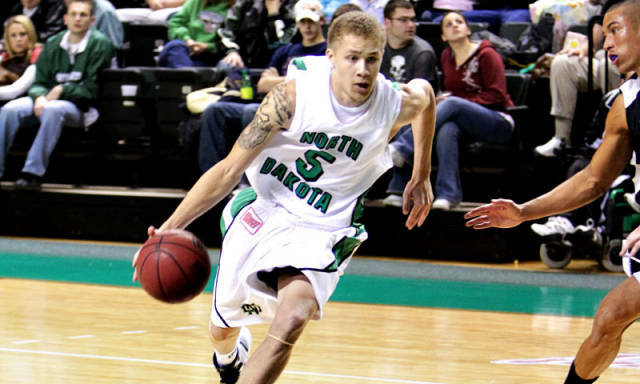 He had a fine freshman season, though he played only 15.8 minutes per game, that was one of the most for post players in UND's guard heavy lineup. He was a very efficient scorer, shooting over 61% from the field (for 5.8 PPG). He was one of the best rebounders on the team (and the best offensive rebounders - with a very solid 11.2% OR rate). Again, he is only 6'6'' so he could struggle against big low post scorers, but those are the players he will be called on to defend. The Sioux had no regular over 6'7'' last season, and that fact probably won't change much this season. All in all, UND was one of the better stories of the season, being so young and so reliant on freshman, and they really put things together after a 5-9 start to the year, finishing with 19 wins. Brian Jones will be looking to take the next step this year, winning over 20 games and the Great West Conference again in their final season before moving to the Big Sky. It is all about getting ready to be a competitor in the Big Sky, and they should have the talent to do that. What do you think of these five and about North Dakota as a whole? How will they stack up against the rest of the Big Sky? With games at least against Montana, Sacramento St, and Idaho St. this year (they haven't released their full schedule), they will get a little taste of how things will go and how hard they are going to have to work.